Sen. Bob Menendez became emotional speaking to reporters after a federal jury said it was hopelessly deadlocked in his corruption trial. Nearly three years after a 69-page indictment first threatened Sen. Bob Menendez's political career and freedom, and two months after a jury deadlocked over his guilt or innocence, the Justice Department said Wednesday it would drop the bribery case. Prosecutors, citing a judge's decision last week to acquit Menendez of some of the charges, said they would move to dismiss the grand jury indictment of the senator and his codefendant, Florida eye doctor Salomon Melgen. Menendez (D., N.J.), who has served in the Senate since 2006, will now seek reelection with the full support of his party — and without the cloud of a retrial hanging over him. That's a dramatic shift in just a couple of months with impact beyond New Jersey. In the fall, as Menendez was on trial, national Democrats worried that a conviction could force the senator to resign — a crucial loss in a nearly evenly divided chamber — and pave the way for a Republican appointment by then-Gov. Chris Christie. And some New Jersey Democrats were maneuvering to run for the seat. Menendez, 64, said Wednesday he was grateful prosecutors had reevaluated their case. "I never wavered in my innocence and my belief that justice would prevail," he said in a statement. "I have devoted my life to serving the people of New Jersey, and am forever thankful for all who have stood by me," the senator said. "No matter the challenges ahead, I will never stop fighting for New Jersey and the values we share." Mike Soliman, Menendez's top political adviser, left no doubt about the senator's intention to seek reelection in November. "Senator Menendez is 100 percent running for reelection, and will run a strong campaign, leaving no stone unturned in communicating with New Jerseyans and fighting Donald Trump on their behalf," Soliman said. The news, announced almost five years to the day after federal investigators raided Melgen's South Florida office, is a major defeat for the Justice Department. Menendez was the first sitting U.S. senator to face public corruption charges since Alaska's Ted Stevens, who was convicted in 2008 but later exonerated because of prosecutorial misconduct. Prior to U.S. District Judge William H. Walls' ruling last week, prosecutors had said they would retry the case. The first trial in Newark, which lasted 11 weeks, ended with a hung jury and mistrial in November. Although the jury failed to reach a unanimous verdict on any of the 18 counts, jurors later told reporters that the vote was 10-2 in favor of acquittal. Walls granted the defendants' motion for acquittal on seven of the charges, ruling that prosecutors had failed to introduce evidence demonstrating an explicit quid pro quo — that is, an exchange of something of value by the gift-giver for an official act by the senator. That ruling applied to bribery charges that were based on Melgen's contribution of more than $600,000 to political committees affiliated with Menendez during his 2012 reelection campaign. Prosecutors had argued that Melgen made those donations with the intention of influencing Menendez's advocacy on his behalf. They pointed to pressure they said the senator applied to top officials in the Obama administration, including the health and human services secretary, to resolve Melgen's $8.9 million billing dispute with Medicare. "There is no there there," the judge wrote, quoting Gertrude Stein. Menendez was also accused of accepting free trips on Melgen's private jet, vacations at his villa in the Dominican Republic, and a three-night stay at an upscale Paris hotel. In exchange, the government said, Menendez used the power of his office to advance Melgen's personal and financial interests. In their announcement, prosecutors didn't elaborate on the reasons they chose to abandon the case, beyond citing the judge's ruling. But they apparently didn't think they had enough evidence to move forward. Defense attorneys argued at trial that prosecutors were trying to criminalize the senator's friendship with Melgen. Scott Resnik, a former federal prosecutor in New Jersey, said the ruling made it harder for the government "to weave together a convincing narrative that you can prove the illegality at issue." "I think what this really speaks to is the difficulty in general of bringing a public corruption case based almost entirely on circumstantial evidence," said Resnik, now a criminal-defense attorney with Katten Muchin Rosenman LLP in New York. He noted there was no direct evidence such as recordings or testimony from a cooperating witness. Menendez may waltz to his party's nomination in June, but Republicans, who haven't won a U.S. Senate race in New Jersey in more than 40 years, say they're eager to run against a wounded candidate. The Republican nominee is likely to point to Melgen's conviction in a separate criminal case last year on Medicare fraud. Prosecutors in that case are seeking a 30-year prison sentence. 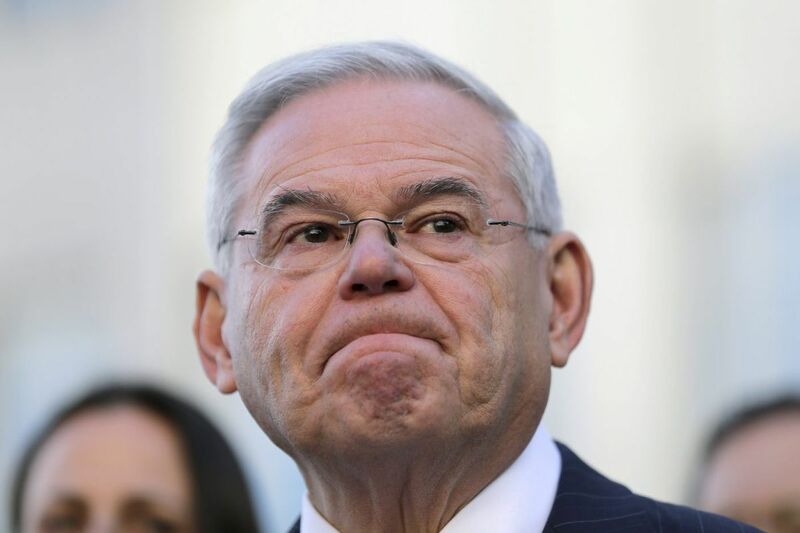 Thirty-six percent of New Jersey voters disapprove of Menendez's job performance, compared with just 29 percent who approve, according to a November Rutgers-Eagleton poll that was conducted after the mistrial. But a big chunk of voters didn't provide any opinion of the senator. "Senator Menendez's real judge and jury will be voters who have already indicated they overwhelmingly find his behavior unacceptable," said Doug Steinhardt, chairman of the New Jersey GOP. Among those considering running is Robert Hugin, who recently retired as executive chairman of Celgene Corp., a pharmaceutical company. "Party leaders are enthusiastic" about Hugin's potential candidacy and are "urging him to run," said Bill Palatucci, a Republican national committeeman in New Jersey and adviser to Christie. Hugin hasn't yet made a decision, Palatucci said.